Auteur filmmaker Wes Anderson is known not only for his quirky plots and characters, but for his sense of design. His movies such as The Royal Tenenbaums, Moonrise Kingdom, and the Oscar-winning The Grand Budapest Hotel all contain a strong sense of symmetry, muted color palettes, and minimalism which have come to be the director’s signature. 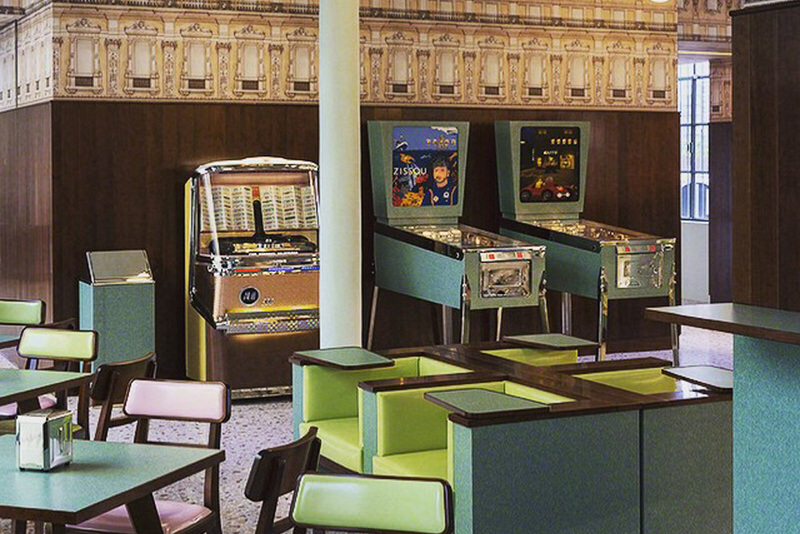 So it was with that same attention to detail that Wes Anderson designed Bar Luce, a café in Milan, Italy. Notable for readers here is that prominently featured in the design are two old-school wedgeheads, one of which is a Life Aquatic Pinball Machine. This Life Aquatic pinball machine is simply titled “Zissou” (after the titular character played by Bill Murray in the film) and is obviously a re-themed ’60s or ’70s era Gottlieb wedgehead electro-mechanical machine. The other pinball only features the word “Café” on the backglass, but both machines are styled in the same monochromatic green color scheme. Filling out the coin-op section of the bar is a classic jukebox filled with classic Italian pop songs. Anderson is quoted as saying, “While I do think it would make a pretty good movie set, I think it would be an even better place to write a movie. I tried to make it a bar I would want to spend my own non-fictional afternoons in,” which makes us believe he is a pinball fan which begs the question: when will the world see a Rushmore pinball?